During the winter months, the RoadAbode Crew dream about where we want to go for our spring, summer and autumn outings. Sometimes we'll remember and discuss the awesome places we've been. The RoadAbode Crew love to explore new places, but sometimes it's fun to revisit a place we had a blast at before. The Watkins Glen area in the Finger lakes region of New York is one that we really enjoy and can place in both categories. We've been back to the area multiple times, and each time we discover new things to do, along with revisiting the places we've enjoyed before. Below, the RoadAbode Crew want to help you explore some of Watkins Glen's surrounding natural beauty, it's racing history, a little of the Wine Country of Seneca Lake and options to tempt your taste buds. The Corning Museum one town over and the campgrounds the RoadAbode Crew have personally enjoyed are also below to check out. 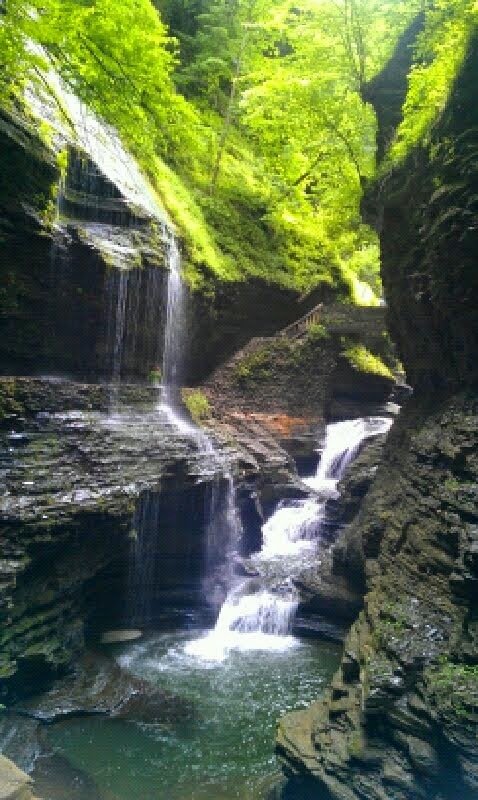 If you have not visited Watkins Glen New York yet - put it on your "gotta visit" list! The area now known as the Village of Watkins Glen was originally named in 1842 as Jefferson, but was renamed after Dr. Samuel Watkins. Doctor Watkins helped to create and build the community. After his death, the area was renamed to Watkins. The current name Watkins Glen was adopted in 1926, after the area became a popular tourist spot because of the beautiful cascading waters of the Gorge of Watkins Glen. The Village of Watkins Glen is nestled at the foot of Seneca Lake in Schuyler County in the Finger Lakes region It's also not far from Ithaca New York ~ home to Cornell University. If leaving from a campsite at the State Park itself, the feeder trail from the campground will drop you to the South Rim trail, and from there the Mile Point Bridge will bring you just above the wonder of Spiral Gorge. Just remember as you hike past the beauty of stone carved out by water "What goes down must go up" and at some part of your journey you'll have to hike back to the top of the rim. Make sure to have a water bottle and stay hydrated. You can refill at the gift shop at the main entrance, or the snack shop at the upper entrance. And just a warning ~ the "Couch Stairs" trail back to the South Rim is steeper and longer than it looks! There's a reason you need a "couch" at the top! The RoadAbode Crew recommends starting at the Main Entrance, taking the shuttle to the top and enjoying the hike down. Even so, be mindful there are plenty of steps. Here is a NY State Parks map including descriptive highlights of Watkins Glen Gorge. The Gorge and State Park are not the only place to enjoy natural beauty in the area. Take a stroll along Seneca Lake at Lakeside Park, or explore the Queen Catherine Marsh area and hike to the birding observation platform on Rock Cabin Road. On our guys trip we drove Rock Cabin Road - a small dirt road - be careful not to drift to close to it's edge) and sat at the bird observation platform for about 40 minutes. It overlooks the marsh, and was beautifully peaceful in it's solitude. For more water-based fun, take a fishing charter out onto Seneca Lake. Trout, Bass, Perch, Pike and even Atlantic Salmon are found in the deep waters of Seneca Lake. More information on fishing can be found here. Sightseeing excursions and dinner cruises are a great way to get on the water and just relax. For more adventure try renting a boat to explore the lake; or kayak, and canoe the lake and inlet to the marsh. The Glen Harbor marina is located right next to Clute Park and Campground. Fun Fact: Because of it's depth and length, Seneca Lake is home to a sonar and submarine equipment testing facility run by the U.S. Navy. There have been sightings of submarines in the lake, though unconfirmed by the Navy. "The Guys" at "The Glen"
We love to watch NASCAR, and other road events, but have not attended one at Watkins Glen International ourselves. Watkins Glen has a rich history of racing, and on race weekends it does keep the town hopping! "The Glen" as it's called by racing enthusiasts annually hosts one of the nation's premier vintage events, the Zippo U.S. Vintage Grand Prix The featured highlight of the Festival is a tribute to the original Grand Prix races using the original 6.6 mile road course. The Watkins Glen Grand Prix Tribute is designed to recreate the ambiance of the 1948-52 Watkins Glen street races. Initially, public roads in the village were used for the race course. In 1956 a permanent circuit for racing was built. 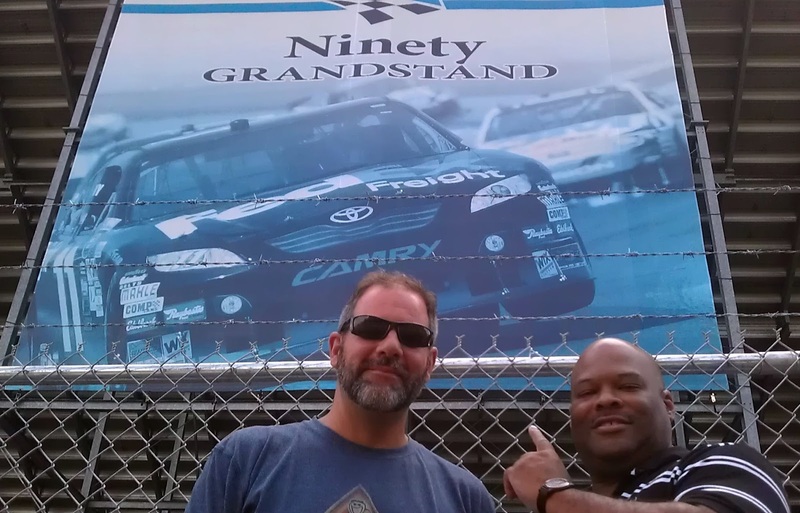 On our Guys Weekend, we happened to to go on the weekend of the NASCAR Sprint Series at the Racetrack. (as of 2013 named "Cheez-It 355 at The Glen") Even though the town was full of race fans, we still had no problem getting around. We even took a ride up to the track and walked around. (the outside perimeter, tickets just to walk inside were $100!) We even saw a time trial accident on one of the Jumbo screens surrounding the track. In town, there were plenty of memorabilia vendors to check out, along with a few cars and parts on display. It seemed the diffrent race teams were "crusing" the main drag with tricked out semis the eveing before the race. A real party atmosphere. If you are into Motorsports, "The Glen" should be on your list to check out. Lakewood - The tasting room was close to Watkins Glen, and near the lake. Our tasting was fun and laid back, Our server was both knowledgable about the wines, and the local area - and had a great wit to boot. I really enjoyed their Riesling, but I do tend to like toward the sweet white side. Castel Grisch - Both a restaurant and winery, I was disappointed that the long gravel road didn't lead to an actual castle, but my disappointment was quickly diminished by the informative and talkative ladies that help us sample not just wines, but cheese pairings as well! (There is a whole Artisan Cheese-making trail in the area that we have not tried yet!) At Castel Grisch we enjoyed the Taminette and Cayuga White wines. I wish I remember the cheese we purchased, but it was creamy, herbed, and we thoroughly enjoyed with more wine relaxing back at RoadAbode that the evening. We did not dine at the restaurant, but the German-Hungarian menu items looked tempting. Definitely want to return and do some more in-depth "sampling". Red Newt Winery & Bistro is on the western side of Seneca Lake, We had wanted to stop by earlier for a special "Summer of Swine" Roasted Pig. The festivities were over by the time we got there. However our server was able to talk to the chef and procured pork sandwiches for us, and suggested a superb red wine to pair with, making for a great dinner. Thanks to Bonnie our server for going the extra mile! Surrounding the Southern portion of Seneca Lake we have visited are not just wineries, but great brew pubs and from our Guys RoadTrip - the favorite stop - Finger Lakes Distilling, also on the western side of Seneca Lake. Finger Lakes Distilling is the region's largest craft distillery. 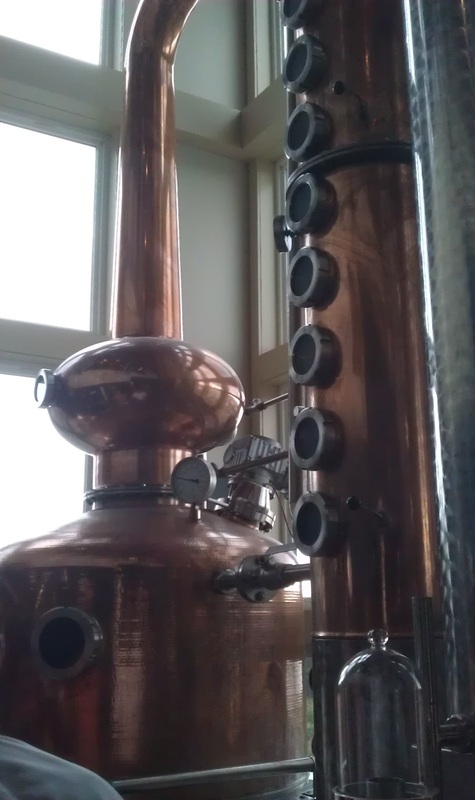 They use locally grown fruit and grains to produce their high quality, handmade spirits. Ed, one of the guys along for the weekend is a real connoisseur of spirits, especially whiskies and gins. The woman who helped with our tasting was a fount of knowledge and actually owned a small bed and breakfast in the area. She and Ed had fun comparing notes while tasting and because of the rapport and her kindness, took us on an "unscheduled" tour for a behind the scenes look of the distilling process. Ed was impressed enough to buy a few bottles, and I as usual led with my sweet tooth and purchased their MapleJack liquer. It starts as an apple brandy, aged in oak barrels and then sweetened with local maple syrup. It's really good over ice cream. Yummy! When we go RVing, one of the ways we enjoy relaxing is to go out for a meal. Watkins Glen area has plenty of opportunities to enjoy a breakfast, lunch or dinner out. Jerlando's Ristorante & Pizza Co offers Italian Specialties in a family friendly atmosphere. Next to Lafayette Park, Tobes is a great place to stop for breakfast and since you are on vacation, grab a freshly baked doughnut too! This place doubles as an ice-cream parlor after breakfast. If you like pancakes, omelets, and hash browns, this places serves them up with a small town diner feel. If you are on the main drag and in the mood for craft beer, try The Wildflower Cafe, which is also home to the Roosterfish Brewpub. Their fare features local and fresh ingredients. If you are in the mood for a margarita with your meal, head over to Garcia's Mexican Restaurant. 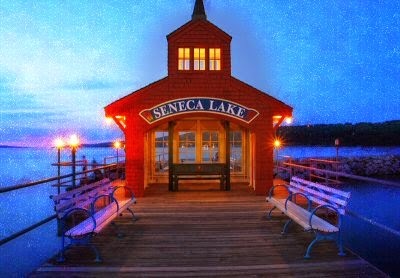 And for something a little more fancy, Seneca Harbor Station, a converted railway station, has beautiful views of Seneca Lake from either the restaurant, deck, or beach-side tables. a fancier dining experience, with pricing to match. For dessert, stop by Great Escape, Colonial Creamery or Glen Dairy Bar for ice cream and yogurt based treats. Some cool, unique flavors! Only 30 minutes from Watkins Glen Village is the town of Corning. The big draw for us is the Corning Glass Museum, The museum is a Science, History and Art Museum all rolled into one. There are live demonstrations of creating glass objects, and the science of how glass helps us in everyday life, from fiber optic cables, windshields on cars, to the "Gorilla Glass" used in smartphones and tablets .The town offers many more reasons to visit. In 2013 Corning was chosen by Rand McNally as "The Most Fun Small Town in America" From the Rockwell Western Art Museum to the various festivals that happen, We haven't discovered all this town has to offer yet. We do love the brick oven pizza at Apollo Pizzeria on East Market Street! When RVing, a campground can make or break your impression of an area. The Three campgrounds we've enjoyed are all different, and we like them for different reasons. The Watkins Glen/Corning KOA is great for young families. This campground between Watkins Glen and Corning New York features a heated indoor pool, a pirate ship, lazertag, zipline and more activities going on to keep the kids and active parents happy. Meetup with non-RVing friends who can stay in the on-site cabins. The campground features over 100 RV sites, including premium sites with a concrete patio and full hookups. Our girls really enjoyed the indoor pool and strolling along the hiking trail and over to the fishing pond to see what was being caught. If you're looking for more of a wilderness experience for friends and family, Watkins Glen State Park Campground is located within a short hike to the Gorge There are over 300 campsites with centralized restrooms, hot showers, and a dump station. Many sites have electric, with water fill stations located at locations on each camping loop. There are no full hookup sites. The park has its own Olympic-sized pool (used by campers and other visitors) and overlooks Seneca Lake.The woods provide plenty of shade in the summer months, and spectacular colors in the fall. The third campground we have used for a guys weekend, and a year later a girls weekend away. both "adults getaway" weekends. Clute Memorial Park and Campground is run by the parks and recreation department of Watkins Glen Village. It is alongside the city boat launch and within walking distance of a Super Walmart and downtown Watkins Glen. This campground has amenities for kids, but no pool and the one shower house seemed a little more worn, but very nice. The Girls from their weekend stated that the showerhouse by the office was great. There are limited shaded spots to setup at this campground, but it's the location that is the draw for us. There is a swimming beach across the road in Seneca Lake. For our adult getaways, we liked the location because of the easy access to Watkins Glen downtown, the Gorge. and it is a great starting point for our Finger Lakes Wine Tour. We also like having full hookups with less cost than the KOA. For our guys weekend, we just drove five minutes up the road to take a swim in the State Park pool. Being able to walk along Seneca Lake, or to go shopping or dining in town was a big plus for us. All three campgrounds are great - each a unique experience. Which to choose all depends on who is along on your trip, and what they enjoy and feel are necessities when RVing. Hope the info above helps convince you that Watkins Glen NY and the surrounding area is worth checking out. 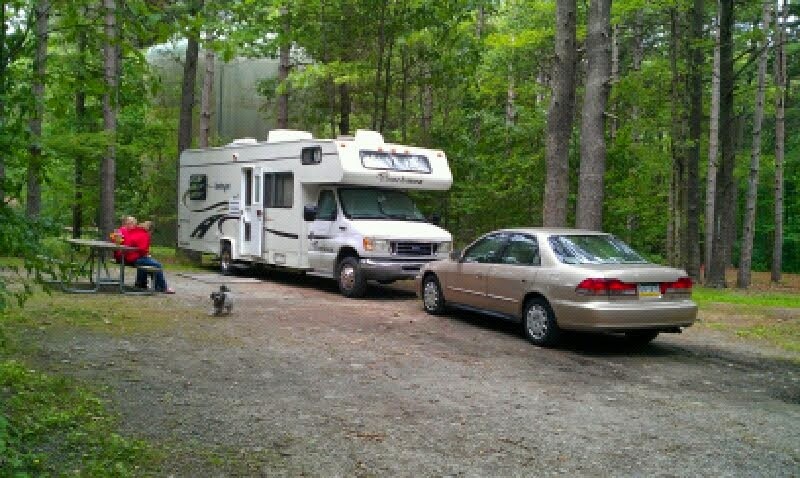 We truly love what the area has to offer for those RVing in the mid-Atlantic states.. I'm sure the RoadAbode Crew and friends will be back - there's still tons to discover, and plenty we want to re-visit. From festivals, to wine tasting, to great eats, Watkins Glen is on our short list of "Hey - let's do that again!" If you have other tips about what to do and see in the area, we'd love for you to share! Please comment below if you have tips - or questions we could answer for you. Enjoy life ~ Go RVing!